This beautiful bead is handmade in Bali Indonesia. 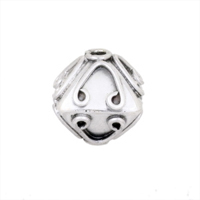 Sterling Silver Bali Bead measures approximately 8.5x8.5mm. Hole is 1.25mm. This beads works well with 8mm crystal. Use it in all of your jewelry making projects.